The best week of the year at Evolv Health & Wellbeing Store is coming up again! We’re counting down to Spring Into Health Week 2018. It will run from Monday February 26th to Saturday March 3rd. Daily specials on treatments and therapies. €10 all-natural facials each day, with either Dr. Hauschka, Holos, Australian Bush Flower, or Dead Sea products. Lots of Buy One, Get One Free offers. Up to 50% on selected products each day. Cookery demonstrations and tasting sessions. Some pics from last year’s Spring Into Health Week will give you an idea of what to expect this time too. We look forward to seeing you! 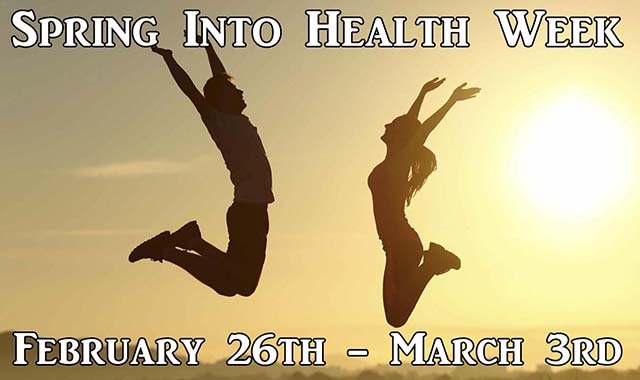 Spring Into Health Week 2018 will be even more special than any other for us…because it will also see us celebrate our 25th birthday. We opened the doors at Evolv on March 1st in 1993, so on March 1st this year, we’re going to have a party! That will be the Thursday of Spring Into Health Week, so come along for cake and goodies…and your chance to win a hamper that’s jam-packed with some of our most popular products. You can view or download a PDF of our brochure using the button below, or else see the flipbook underneath. Also keep an eye on our Facebook page for more details as the big event draws near. And if you want to avail of any our special offer treatments or therapies, don’t forget to book by calling (053) 9236009. They fill up fast – so don’t miss out!